Climate engineering and the risk of rapid climate change. Andrew Ross and H Damon Matthews. 2009 Environ. Res. Lett. 4 045103. Permission: IOP Publishing Ltd, under a Creative Commons CC BY-NC-SA license. These days, an article headlined “Geo-Engineering Seen as a Practical, Cost-Effective Global Warming Strategy” would hardly be surprising. But what is surprising is that the headline came from a group denying global warming exists: the Heartland Institute in Chicago. Well-known for its aggressive contrarian position on manmade global warming, and widely lambasted for its “I still believe in Global Warming. Do you?” billboard featuring a picture of Ted Kaczynski, the Unabomber, the Heartland Institute might seem unlikely to propose a solution to a problem it doubts exists. So why did the group run an article on geoengineering in the December 2007 issue of its newsletterEnvironment & Climate News? But Schnare’s article, written just a year after Nobel Laureate Paul Crutzen’s seminal and controversial 2006 article calling for serious active research into solar radiation management, ignores the many complications, side effects, and unintended consequences of SRM that worry many. Crutzen had specifically mentioned undesirable destruction of protective stratospheric ozone. And SRM does nothing to stop ocean acidification, instead creating a world never before seen, high in carbon dioxide while relatively low in temperature. Despite this article and others, and at least one presentation at its annual conferences, “Heartland doesn’t have a position on geoengineering,” according to Joseph Bast, the Institute’s president and CEO. The Heartland Institute is hardly alone in considering geoengineering as a solution to a problem it basically doesn’t see as a problem in the first place. In recent years, Bjorn Lomborg has often downplayed the threats from climate change while pushing geoengineering as a short-term solution. So too have Newt Gingrich, the former EPA staff economist Alan Carlin, and the American Enterprise Institute, which earlier this year posted a seminar calling solar radiation management “an evolving climate policy option” on its website…a site chock-full of climate contrarianism. How might one reconcile such seemingly contradictory positions? and why do they often come from politically conservative individuals and organizations? In his recent book, Earthmasters: The Dawn of the Age of Climate Engineering, Clive Hamilton argues that this pair of positions maintains the dominant power structures of society, especially the roles of the energy mega-corporations that have a great deal to lose from any shift away from fossil fuels. Like a patient who will accept the doctor’s diagnosis only if the illness is treatable, a solution to global warming that does not destabilize a person’s worldview — but in fact validates it — makes recognizing the problem palatable….As the identity of conservative white males tends to be more strongly bound to the prevailing social structure, geoengineering is the kind of solution to climate change that is less threatening to their values and sense of self….they are consistent with the ideas of control over the environment and the personal liberties associated with free market capitalism. Just as the need to defend a cultural worldview makes conservative white males prone to repudiate climate science, so that worldview will make them prone to support geoengineering solutions. This thesis helps explain many of the current sharp divisions over public policies, especially those with scientific origins such as climate change, vaccinations, and genetically modified foods. Those with values that place more emphasis on the individual would be expected to dismiss environmental and technological risks if solving them requires restricting industry and commerce. Those who more highly value egalitarianism and community are generally suspicious of capitalism’s disparities and its emphasis on individual initiative, and they therefore are more likely to advocate top-down regulation of commercial activity. 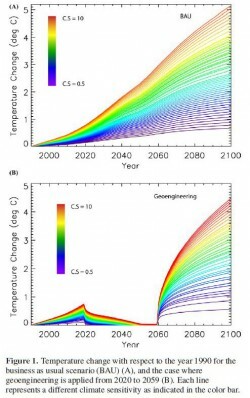 In the context of climate change and geoengineering, Kahan and his colleagues found that making their study participants aware of geoengineering’s potential to address climate change, while making them aware also of restrictions of carbon dioxide emissions, helped to overcome the cultural polarizations that dog the climate change issue. The researchers found too that their study subjects exposed to geoengineering ideas — in particular those who more highly value individualism — were slightly more concerned about the risks of climate change than those who were not exposed. All people are prone to the cultural cognition thesis, especially those at the more extreme ends of the spectrum. But not all realize that the thesis goes both ways. For instance, the conservative writer Jonah Goldberg — who often downplays the risks from climate change (he recently wrote in the Los Angeles Times, “OK, things have gotten a wee bit warmer outside”) while advocating a geoengineering approach —accused “global warming alarmists” of advancing solutions that appeal to their core cultural values. In aninterview last year with RightWing News.com, Goldberg said, “One of the reasons why conservatives are right to be suspicious of global warming is that it confirms the exact same suite of policy approaches that these people were arguing for when they were worried about a population bomb. You know, managed scarcity, throw a wet blanket on capitalism, manage the economy.” But Goldberg did not acknowledge that his own beliefs and ideology might influence his attitude and approach to the climate problem no less than those he was criticizing. The reality is that geoengineering itself carries risks, raises difficult ethical considerations, and poses the possibility of unintended consequences, so it is not the slam-dunk first choice solution to problems posed by a warming planet. Ironically, some of those who say climate is too complex to be forecast, or who criticize models used in climate science as being incomplete or inaccurate, seem to have no trouble advocating geoengineering quick fixes which themselves carry climate and environmental complexities, or which would require extensive modeling to understand implementation and implications. All geoengineering schemes have unwanted side effects, and some can be significant. Solar radiation management by aerosol injection into the upper atmosphere, for instance, mimics large volcanic explosions, like the 1991 Mt. Pinatubo eruption that caused about one degree Celsius of global surface cooling for a year or two (returning to normal over the succeeding three years). But that eruption also caused a 10 percent drop in worldwide precipitation, because it reduced evapotranspiration rates over land, and that situation didn’t return to normal for about three years. There are concerns too that solar radiation management would reduce the essential Asian monsoon orcause drought in Africa. A recent modeling experiment by Simone Tilmes, of the National Center for Atmospheric Research, and colleagues found regional rainfall reductions of up to 7 percent when geoengineering reduced incoming solar energy so that climate forcings were at a pre-industrial level even as atmospheric carbon dioxide levels quadrupled. 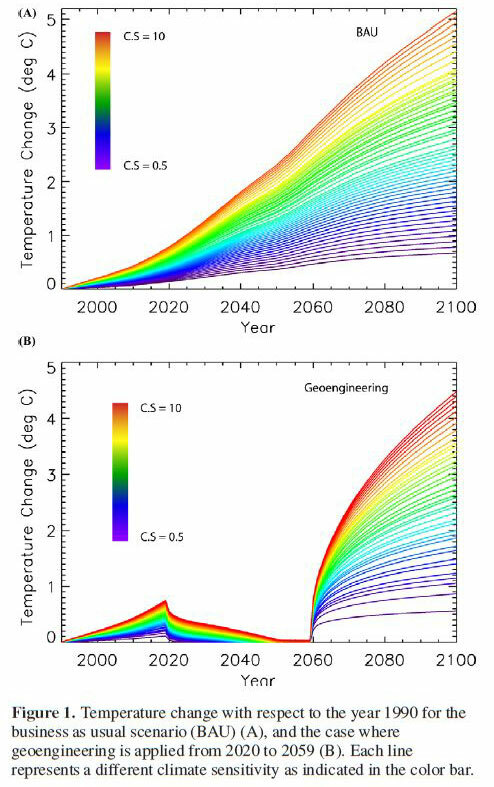 There is another large cost to geoengineering by solar radiation management: once undertaken to reduce temperatures, it must be kept up essentially forever or warming will resume in a very rapid and dangerous fashion (see figure). Andrew Ross and H. Damon Matthews, in a study published in Environmental Research Letters, found that temperature would rise by up to 0.76°C in the first year after termination of a 40-year (2020 to 2059) SRM project, with up to another degree in the next two decades. Such abrupt climate change can shock ecosystems, especially affecting marine biodiversity by giving advantage to mobile or opportunistic species. It would be even more abrupt and dangerous if atmospheric carbon dioxide levels were to rise ever higher. Such threats would hang heavy over future generations, obligated to pay billions of dollars every year to continue to manage solar radiation for an increasingly out-of-kilter planet they did not create, having to carry the burdens of rapid and abrupt climate change were war, revolution, or economic distress to force a halt to the risk management effort. Since Crutzen’s 2006 paper, geoengineering is no longer a taboo subject, feared even for polite discussion, because it can offer an alternative way out of a nagging carbon problem — bariatric surgery instead of strict dieting. Many scientists now are seriously exploring solar radiation management and ways to remove carbon dioxide from the atmosphere, philosophers are weighing the moral and ethical dimensions of geoengineering, and even a few environmental groups have opened their minds to concepts once considered anathema. The newly released IPCC Working Group I Fifth Assessment Report mentionedgeoengineering for the first time ever. Geoengineering solutions retain the idea of human’s technical mastery over nature. Instead of human societies changing to accommodate the natural world they rely on, climate engineering — consciously or not — is the view that nature can be fundamentally bent and manipulated to accommodate humanity. Wresting with nature is, in a very real way, the story of human development, and taming the wild world has brought some (but by no means all) wealth, relative comfort and ease, and freedom from basic wants. At the same time, that insistence on control now poses risks to the planet as the most fundamental stage on which that existence plays out. Originally posted to Yale Climate Connections.